Click-through for the whole infographic. There are many categories on this infographic that give examples of sustainable cities and the actions they are taking to help the planet. New York City is well on its way to planting 1 million new trees by 2017, while Vancouver pledged to plant 150,000 new trees by 2020. Copenhagen has introduced a legal requirement for vegetation-filled green roofs which will add a lot of green space to the metropolitan area. People in London are getting rid of their cars, bicycles rule the streets of Amsterdam, and Stockholm, Sweden gets almost half of its energy from renewable hydroelectric power. But how do these measures help? Planting trees and increasing green space allows for more oxygen. It also reduces energy use by shading houses in summer, lessening the need for ridiculous amounts of air conditioning. Riding bicycles instead of cars and using renewable energy lessens the amount of harmful carbon dioxide entering the atmosphere. Example of cities that are using bikes instead of cars. There’s more. The populations in many global cities are increasing energy efficiency by using renewable sources, ditching their cars, and recycling more. 3 of the many cities that use too much water per capita. Not only is the US starting to change, but the world is too. We just have to work on one of our most precious resources, WATER, and then the planet will start to notice a difference. Say what you want about California. They do have a ton of people, (population 38 million and climbing), so they have been contributing a lot to US emissions and other environmental problems in the past. However, this is changing, and California is leading by example. Recent studies suggest that the STATE OF CALIFORNIA is well on it’s way to meet it’s carbon reduction/climate goals. The Lawrence Berkeley National Laboratory, known as the “Berkeley Lab,” completed a study last December 2013 that shows California is on track with decreasing their carbon emissions by the goal of 2020. The golden state has done this through vehicle standards, the Low Carbon Fuel Standard, an increase in renewable energy, the Zero-Emission Vehicle Program, and a few other similar programs. The report also found that rigorous adhesion to current plans paired with an expansion of some current programs, California can exceed their state-wide emissions goal by 2050. This is a rare feat – a lot of cities around the US make these types of carbon goals but don’t reach them by the target goal year or don’t make rigorous enough plans to do so. States with bag bans/taxes – click through for interactive map. California citizens are also working well on small scales in certain cities to combat other environmental issues besides climate change. California cities were among the first to tax the use of plastic bags, which do not belong in landfills as they do not decompose. Here is a list of some of the actions some areas are taking to help the environment! Fresno recycles – a lot. FRESNO: The residents of Fresno, a small city north of Los Angeles, recycle a whopping 73 percent of their waste. Most cities in the US recycle 30-50 percent of theirs, for comparison. In Fresno, recyclables are aplenty. This type of landfill reduction means that they utilize sorting machines and with the help of some “innovative recycling companies,” repurpose their recyclables into renewable paper, cans and gasoline (yes, gasoline). They are also able to compost large amounts to use for their booming agricultural industry in this area. Read more at National Geographic. 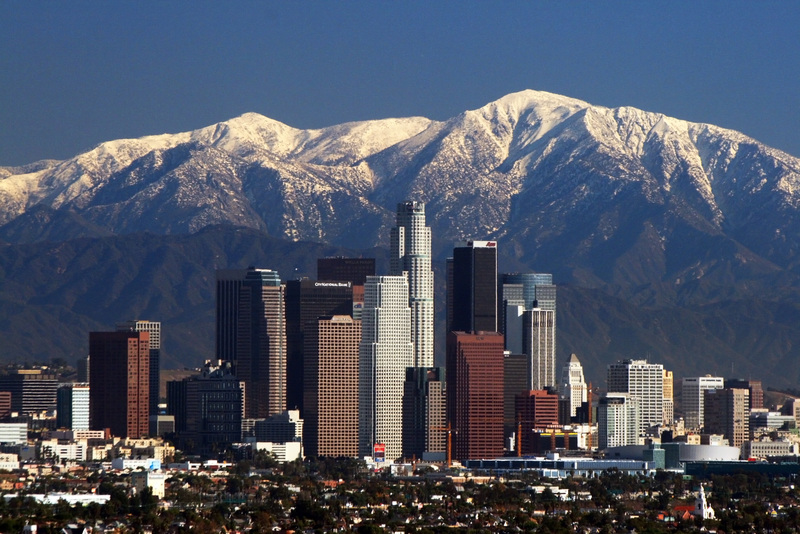 LOS ANGELES: The Los Angeles Department of Water and Power, responsible for commercial and residential electricity and water, started offering solar energy incentives for businesses and residents last year. This tariff incentive program reimburses those who use solar energy. Read more on Solar Reviews. 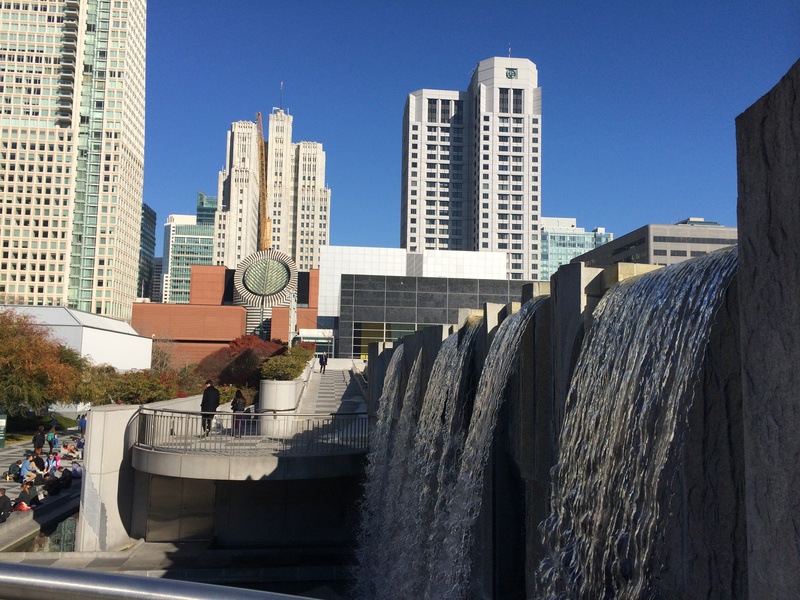 SAN FRANCISCO: Not only did San Francisco create a plastic bag tax, which I experienced first-hand, but has also recently banned sale of plastic water bottles on city property (under 21oz, so 2 liter soda bottles are exempt). Sporting events are excused from the ruling, and food trucks have until 2018 to comply. Everyone else isn’t so lucky. Companies have until October 2014 to stop selling plastic bottles or they will be subject to fines. Taking water bottles out of commission in San Francisco will stop the non-degradable plastic from entering landfills, where it stays a bottle for pretty much forever. Read more at MSNBC. So, this shows that a state with a large population like California has the power and determination to make a change. More states should follow (and have already started to!). On Saturday, March 29th, celebrate Earth Hour by turning off your lights at 8:30pm local time! This celebration started in Australia in 2007, and has grown to a world-wide grassroots movement to help educate people on building sustainable communities. They hope that turning off your lights for one hour will lead to a more sustainable world! Turning off lights for 1 hour saves electricity, but if it helps people realize that lights don’t need to be on all the time, this saves even more energy. Last year, people were encouraged to add their voice to a wall of stories. This year is no different. Participants are encouraged to create their own event and support sustainability efforts around the world. This year, monuments around the country are turning off non-essential lights in celebration. Current buildings/monuments include the Space Needle (Seattle), the Gateway Arch (St. Louis) and the Empire State Building (NYC). List of monuments participating – tweet the ones not listed to get them involved! For more information, check out this video. And this weekend, make sure to light your candles instead! 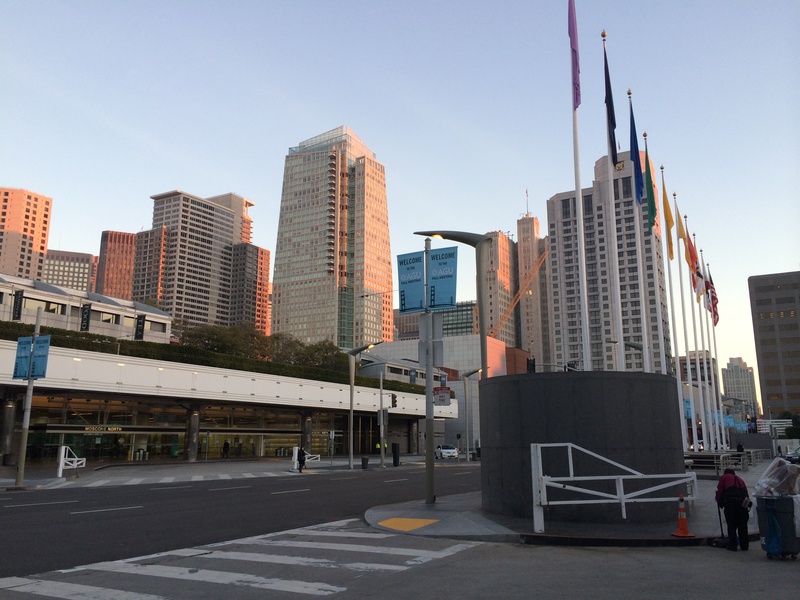 AGU 2013: Thursday – Poster Presentation Day! Again, as the title suggests, today was the day of my poster presentation, my second here at AGU (read last year’s blog post here). But first, I headed on over to “Using Video to Enhance Science Communication” session of talks. This session was a plethora of talks on using video as a communication tool for Earth science students, with examples of student projects! Although I didn’t dabble much in video, I have done Earth science projects in Google Earth, podcasts for tumblr (now moved to a PSU site) and iBooks research. Through these projects, I learned way more about Earth science than I would have through a lecture. So, I applaud teachers who are using videos and other non-traditional classroom exercises in order to provide more understanding. Perhaps if my high school physics teacher used videos I would remember physics! Another presenter, Sarah Thompson of Skypunch Creative, talked about increased video documentation in the field and the uses for this video footage: website content, education for students, and blog post content. The mini-documentaries, interviews, time-lapse photos, motion graphics and regular photographs are all created through the observation of scientific research. This semester in journalism school, I learned that the most important part of scientific research, to the public, is why the public should care: so, this type of project and information can be very helpful in informing the public of the purpose of research and also give an inside look into the world of science (so they can better understand the research project). After this mornings session, I headed over to my poster session! 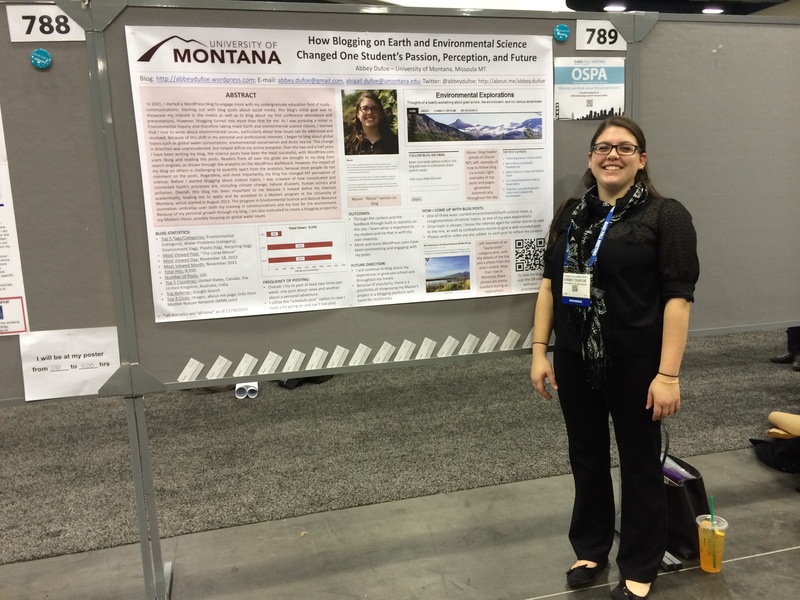 For those who don’t know, my poster session touched on my blog and how it changed my academic career by making me realize that I wanted to write about science/the environment. Check it out! This year, my poster was more straight forward, as it was all about my experiences. Interestingly enough, a lot of students stopped by to talk about blogging practices and whether or not they should start a blog! I also had a few people stop by who were bloggers and needed a little help. I expected questions about my blog and how to create posts that are easy to read. The main outcome that I took from the poster session is that there are a lot of scientists out there who are interested in sharing their research with the public, but are unsure of how to communicate their science. Most of the advice I gave them was to avoid jargon, keep it short and use pictures. I collected a lot of business cards, and can’t wait to check out the blogs! I also got to spend the afternoon presenting to my mentor and past teacher, Dr. G. It was great to talk to people together, as she is a scientist and I am a communicator! She is going to enter the AGU Blogosphere with her educational technology blog soon! Tomorrow, on the last day of AGU, I plan to visit a session on Western Montana, by researchers at my home institution (University of Montana), and spend the afternoon exploring the city! Thanks to all who came to my poster session today!